HOPE FOR NAILS is a product which promises to boost the body’s immunity and defenses against the fungus, which causes nail infections. HOPE FOR NAILS states there is a genetic link between susceptibility to nail infections and aims to boost the immune system to fight such infections. The packaging is a white bottle with green lettering, and the product was created by Dr. Jeffrey Kleis through a combination of natural ingredients. 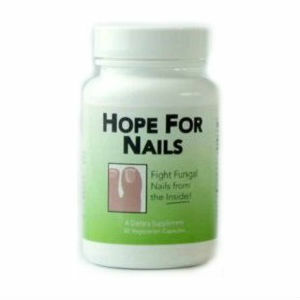 HOPE FOR NAILS sounds intriguing so I set about researching more into this product. HOPE FOR NAILS is proudly made in the USA and contains all natural ingredients and is nontoxic. The benefits of an all-natural ingredient list are that no liver damage can be caused by these ingredients, unlike other stronger medications taken to cure fungus. However, the website could not give a breakdown of what each of the natural ingredients would do to boost the immune system and help the body fight off a fungus so I was a little unclear as to what each ingredients purpose was. Each bottle contains 30 capsules and it is recommended that one capsule be taken daily. The website also states that for optimum results HOPE FOR NAILS should be taken for a minimum of four months and ideally for eight months, which is the time for the nails to grow completely out. One bottle of HOPE FOR NAILS costs $19.95 and at the moment the website is offering a ‘buy three and get one free’ deal, which would save buyers $19.95 for a four month supply, the minimum time frame given for optimum results. At this price it would cost $59.85 for a four month supply or $119.70 for the recommended eight month supply. The website also offers free shipping to domestic addresses. The company does not offer refunds on any items which have been opened or used due to healthy code regulations. While I found HOPE FOR NAILS on this website I could not find it listed for sale anywhere else on the internet. I could not find any reviews, which is a concern. HOPE FOR NAILS sounds like a product with a lot of potential but I would be hesitant to recommend HOPE FOR NAILS given that key information seems to be missing from the website. Jack Stevens	reviewed Hope For Nails	on January 7th	 and gave it a rating of 3.